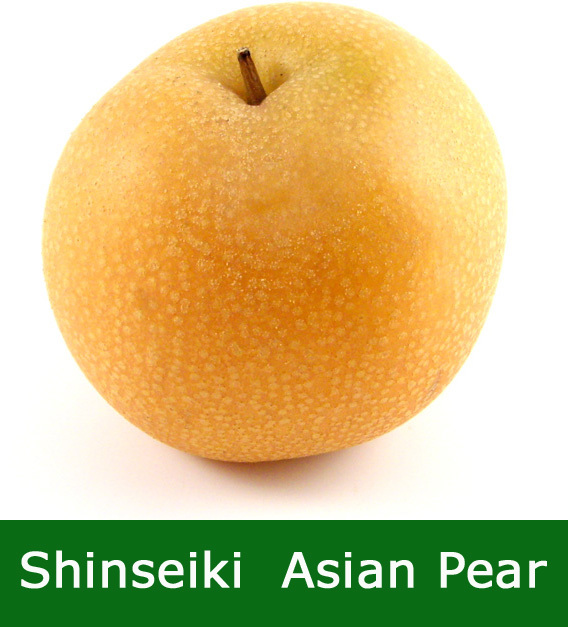 Buy Shinseiki Asian Pears (Pyrus Domestica Shinseiki) online from UK supplier of garden fruit trees. Shinseiki Asian Pears (Pyrus Domestica Shinseiki) is easy to grow, a reliable cropper providing tasty eating pears and pleasing foliage and flowers in the Spring. Some trees have cropped so heavily the branches have broken. Asian Pears combine the distinct flavour of pears with the crispiness of apples and have a distinct but very pleasing aroma. Provided as a bush form in a 7-15 Litre container. Expect a final height of around 4 metres although pruning or restricting the root spread with containers will keep final height lower. Shinseiki Asian Pears will be ready for eating in September and can be kept in the salad crisper part of your fridge for at least a month, possibly three. Kept at room temperature you can keep for up to 14 days, 2 weeks or half a month, which ever is longest!